During the distribution of jumpers, blankets and snacks this afternoon Belal, one of the teenagers, asked if we had any shoes. His and his friend’s were in a dreadful state. The soles were hanging off, they were covered in mud and blatantly not waterproof. After checking with our group leader, Sam, I arranged to meet them later with a pair of trainers for each of them. After communicating through text messages, Sam and I met them. The second hand trainers were put on straight away. They were so pleased to have dry feet with shoes they could walk in without being hampered by flapping soles. Belal and his friend thanked us profusely, with huge smiles on their young faces then disappeared off into the darkness. They are young, 16 or 17, and to watch them walking off, both still smiling, to face yet another night outside in the cold with the constant threat of violence, pepper spray and tear gas from the CRS, was heart breaking. 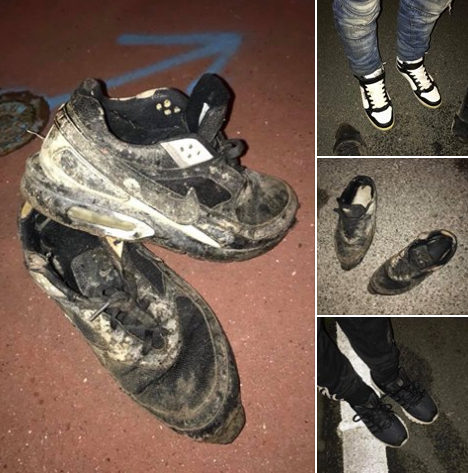 Tonight, I am so grateful for so many things, mainly to whoever donated the trainers and Care4Calais. Without them, none of this would have been possible. I want to thank the donors from the bottom of my heart. You made two teenage boys very happy tonight. I also want to thank Care4Calais for the amazing work they do.